Sustainable. Hake used to be a popular fish in Britain and is making a comeback as our tastes diversify. It’s a delicious member of the cod family and very versatile. As well as UK-landed hake, there are very sustainable sources from Southern Africa. A lot of hake is deported to Spain. Although hake is plentiful, we eat over 80 times more cod than hake. This means a lot of this beautiful fish is deported to Spain where hake, called merluza in Spanish, is one of their favourite fish and features in a lot of popular tapas dishes. Fantastic alternative to cod and haddock. Hake can be swapped for cod and haddock in your favourite recipes. Our recipe for Italian Cod Bake would work just as well with hake. Hake is healthy. 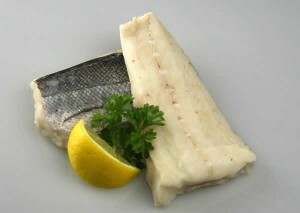 For a whitefish, hake is very high in omega 3, up to three times more than cod and haddock. Also, at just 113 calories per 100g, hake is a very healthy protein choice. Hake is delicious. As well as being an excellent change from cod and haddock, hake tastes amazing. In a blind taste test at Salford University, hake came out on top and we can see why! Available to purchase: We have sustainable North Atlantic Hake (skin on and individually vacuum packed) and sustainable skinned and boned Cape Hake fillets available to buy. In a our luxury prepared range we have our very popular Hake Bakes (Cape Hake, hand topped with a broccoli, leek and cheese sauce topped with crushed croutons) and microwavable hake portions with a bacon and pea sauce.